The Ford Motor Company was recently granted a patent for an external roof rack-mounted airbag system to protect passengers in the event of a car rolling over in a road accident. The airbags would need to be stored inside the rack attached to the vehicle’s roof (thus requiring the vehicle to be fitted with a roof rack). Traditional airbags inflate and deflate within fractions of a second, these external roof rack airbags would stay inflated for longer, as vehicle collision data shows a car may roll over several times before stopping. Interestingly this patent doe not represent the first external airbag as Volvo had previously patented a “pedestrian airbag” that inflates across a car windshield, cushioning the blow for a pedestrian who rolls up the vehicle’s bonnet in a collision. This is however the first external roof rack airbag system that aims to prevent or minimise passenger harm in the event of car rollover situation as a result of a road accident. 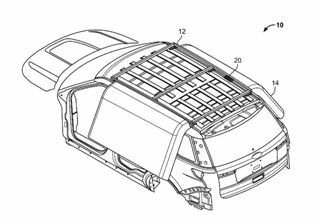 Visual showing the proposed external roof rack mounted airbag system from the filed patent document.